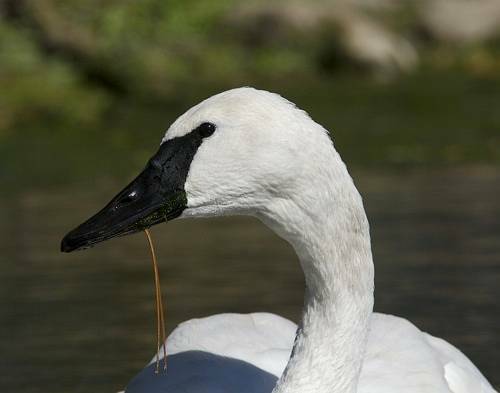 Trumpeter Swan re-established in Ontario: Trumpeter Swans were once so numerous on the Detroit River that in 1701 the commandant of the new fort of Detriot wrote "There are such large number of swans that the rushes among which they are massed might be taken for lilies". These birds were heavily hunted and the last local Trumpeter Swan was shot on Lake St. Clair in 1884. An Ontario re-introduction program began 19 years ago and the population grew to about 400 swans by 2002 and 1000 by 2007. It is now felt that the population has reached a self sustaining population. Similar re-introduction programs in Michigan have also been successful. Starting this year birders can count a Trumpeter Swan sighting on their life list. This winter birders should watch for Trumpeter Swans along the Detroit River and other locations were there are concentrations of waterfowl. In Ontario most Trumpeter Swans winter on Lake Ontario but there is an inceasing chance to find a few in our local area. Friday, Dec 28: The North Shore Christmas Bird Count was held yesterday and covered the eastern portion of Windsor, Tecumseh and Lakeshore region. 59 species were recorded and record high counts were tallied for Rough-legged Hawk (7), Great Black-backed Gull (63), Red-breasted Nuthatch (10), White-breasted Nuthatch (34), American Robin (18), Fox Sparrow (3, new to count), Northern Cardinal (67), Common Redpoll (52, new to count) and Pine Siskin (16, new to count). Monday, Dec 18: The Cedar Creek Christmas Bird Count was held Saturday, December 15th. Visit the Christmas Bird Count page for the results. The Point Pelee count was held on Sunday, Dec 17. Call the nature centre if you would like to participate in an upcoming count (Amherstburg -Dec 22, Lakeshore -Dec 27, Holiday Beach -Dec 28, Detroit River -Jan 01, St. Clair -Jan 01). Saturday, Dec 01: This morning's field trip to Point Pelee recorded over 50 species including Black Scoter, Long-tailed Duck, thousands of Greater Scaup, Horned Grebe, Bald Eagle, Rough-legged Hawk, Dunlin, American Robin, Cedar Waxwing, Yellow-rumped Warbler and Chipping Sparrow. Later we drove over to Kingsville and were rewarded with excellent views of the female Rufous Hummingbird at 95 Queen Street. 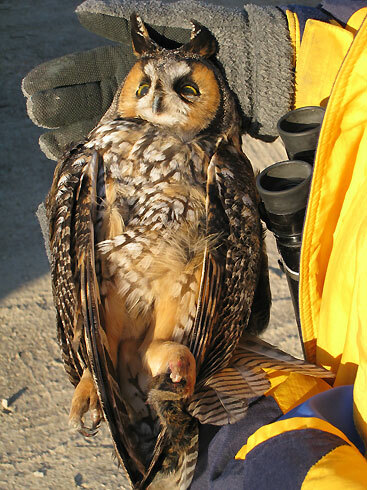 A road killed Eastern Screech-Owl and Long-eared Owl were unusual finds. The Long-eared still had a partially eaten meadow vole clutched in its talons.